Blood passes through a network of blood vessels in our bodies, such as arteries, veins, and capillaries. The semi-permeable property of capillaries causes some fluid to pass outside of it. When fluid effuse into the skin, it causes the skin to swell, this type of condition is termed as Anasarca. The medical term for this type of swelling, when it occurs in the entire body is Anasarca. The swelling can occur in any part of the body including hands, arms, ankles, and feet. Anasarca can symbolize a possibility of major sickness in the patient’s body or it might be a symptom of protein deficiency and malnutrition. It is also called as Dropsy or Generalized Edema. 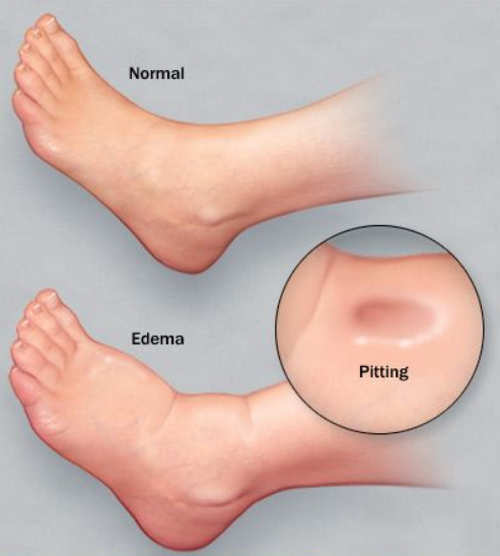 Anasarca is different from edema because in Edema inflammation occurs in a specific body part while in Anasarca is a generalized condition and it affects the entire body. This is the reason why Anasarca is also known as acute Edema. Dimpled skin, which doesn’t restore its natural form, after you press it for some seconds. Normally, Anasarca is caused by blood vessel abnormalities and fluid retention, but there are some other causes as well which gives rise to this skin disorder. When kidney fails, it causes sodium and fluid retention in the body, which in turn results into Anasarca. Apart from the retention theory, Anasarca is also attributed to the loss of protein from the body. Nephrotic Syndrome is a type of kidney disease which causes a deficiency of protein as it gets released in the form of urine. This is another reason for the occurrence of Anasarca. The liver is an organ responsible to produce plasma proteins. In case of liver failure, the number of plasma proteins sees a sharp decline and thus oncotic pressure also reduces. Oncotic pressure is a pressure by proteins in the blood which retains water into the circulatory system. Our heart is responsible for pumping blood. In the case of Cardiac Failure, blood flow reduces and the blood gets held up in the veins, which in turn causes more blood flow to other parts of the body. This phenomenon increases the hydrostatic pressure which causes Anasarca. An absence of nutritious diet causes a deficiency of protein, vitamins, and minerals. When the body gets deficient in protein, the oncotic pressure reduces. When lymph vessels are blocked, the body is not able to remove the excess fluid. This results in the severe form of edema that is, Anasarca. In some cases, the pre-menopause period can also result in this disease. Excess fluid gets supplied to the interstitial spaces due to the leakage of capillaries. This might cause the grave disease of Anasarca. Anasarca is a disease which gives strong symptoms, so the diagnosis of this disease is done primarily through symptoms. Apart from this, medical history of the patient and his/her physical examination also plays a crucial role in the diagnosis of the underlying condition. Also, there are some tests which are carried out to give the confirmed results. This test is done to detect the condition of the heart. Since cardiac failure and Anasarca are closely related, this test is essential in the process of diagnosis. An Electrocardiogram measures the electrical activity of the heart through electrodes. Kidney and liver failure are attributed to be the most common cause of generalized edema or Anasarca. This test tells whether the liver and the kidney is functioning properly or not. Anasarca is said to be caused by renal failure and liver failure. If the liver function and kidney function tests show some issue with their functioning, then, Anasarca might be caused due to them. In urinalysis, a urine sample is collected and diagnosed on different parameters like acidity and protein content. Since Anasarca is also caused by protein deficiency, this test is an essential test for this disease. This test is done to examine the health of liver and kidney. Albumin protein is synthesized by the liver. Whenever there is any kidney or liver disease, the level of protein in the blood reduces. This is also an underlying cause of anasarca. If the problem is caused by thyroid imbalance, doctors do recommend Thyroid replacement therapies. Diuretics like Thiazide which removes excess water. If the cause of the underlying condition is a particular drug, it is recommended to stop the intake of that medicine. Potassium Diuretics: If the underlying condition is caused by Cirrhosis, Aldactone is the most accurate choice. This drug is useful in the treatment of Anasarca because they help in preventing Potassium loss. Furosemide: Furosemide and Diuver are the two most important diuretics used for the treatment of Anasarca. These diuretics help in removal of excess water through urination. Sometimes they are mixed with potassium diuretics, to avoid the loss of potassium in the body. Thiazide Diuretic: This is another important diuretic used in the treatment of Anasarca. It helps in the stimulation of kidney, which in turn, excretes excess water from the system. Rosehip is known to contain bioflavonoids which act as an anti-inflammatory agent. In the diseases like Anasarca, it can prove beneficial. High intake of fluid cause more water retention, which in turn aggravates the conditions like Anasarca. Patients suffering from this condition should take the fluid in limited amount. Regular massage in the affected area, keeping your hands in the direction of the heart can also provide some relief. Exercise is a key to a healthy body. In the case of Anasarca, exercise may prove helpful in combating the symptoms. Try to include high-fiber diet in your diet plan. This will reduce the negative effect of Edema. Use a detoxifier like Alfalfa. Limit the consumption of dairy products, chocolates, beef, and alcohol. This can worsen the condition. Add green tea extract with water and boil it. Add this extract with honey and consume it daily. Increase the Parsley intake as it is a diuretic and can help in Anasarca treatment. While taking rest, always keep the feet elevated from the surface. Yes, it can be cured by proper treatment and prevention measures. It is not a life-threatening disease, though it is normally caused when you have some serious health complications. So you can’t avoid it. How much time does it take to cure this disease? Time can’t be specified. It depends on patient’s recovery and the seriousness of the disease. Also, proper medication and treatment can result in faster recovery. Is Anasarca different from Edema? Yes, they both are different. Anasarca is an acute form of edema. Edema affects a specific organ while In Anasarca the swelling occurs all over the body. Am I prone to Anasarca, if I am a kidney patient? It is not necessary but it might happen. If you notice any of the symptoms of Anasarca then do get yourself tested for it. Kidney patients are more prone to this condition. Though our body parts may swell up for a variety of reasons like allergies and fracture. Anasarca is a serious medical condition which causes the body parts to swell up. Mostly it is caused by renal and liver failure, but there are many other reasons for this condition too. Since now you are aware of this disease, it is advisable to take immediate steps if you notice any symptom related to this disease. There are some health conditions, which affect you not only physically, but mentally too. Anasarca is one of them. It is disturbing feeling when you are not able to do the basic activities in a proper manner. If you don’t want to see yourself in this condition, be attentive to your body, diagnose the cause of your condition and set yourself free from Anasarca. Your life is only in your hand.